Over the past few months, we’ve brought you an exclusive behind-the-scenes look at the development of Julie West’s first original vinyl figures – Bumble and Tweet, in production from STRANGEco. We’ve done Turnaround drawings, sculpts, and today we’re finally moving into color – with a first look at the three colorway pairings --Spring (above), Candy and Tree (after the jump) -- chosen for the production figures. 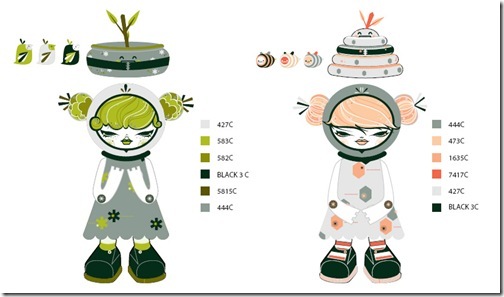 Let’s start with Julie West’s take on the process of creating colorways. That said I really struggled in the beginning trying to decide how to approach the color with Miss Bumble and Tweet. Because they are two figures that go together, I wanted the color to work together as "sets," but also have them differentiated from each other in some way. For this reason I did a lot of variations of the color. I scrapped a lot and started over a few times… I can't recall the total number of colorways that I did, but we did have to narrow it down. At different stages I sent them over for feedback and eventually, I ended up with 3 different colorways that I was very happy with. I wanted to have 3 completely different directions with the color, so I chose to work with different palettes that are recurrent in my work: pinks and reds / earth and nature tones / as well as a subdued neutral range. A few weeks ago we brought you the first behind-the-scenes look at the development of Julie West's Bumble and Tweet, her first original vinyl figures currelty in production from STRANGEco. 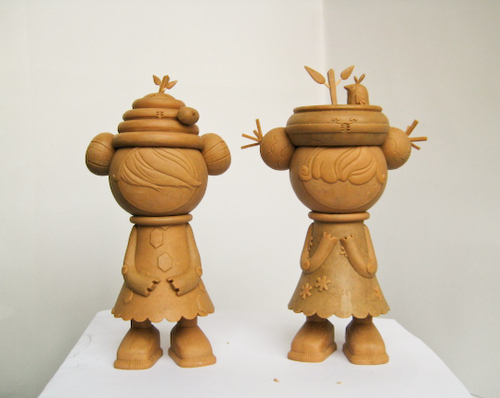 Today we bring you the second part of this series focusing on the sculpting process. 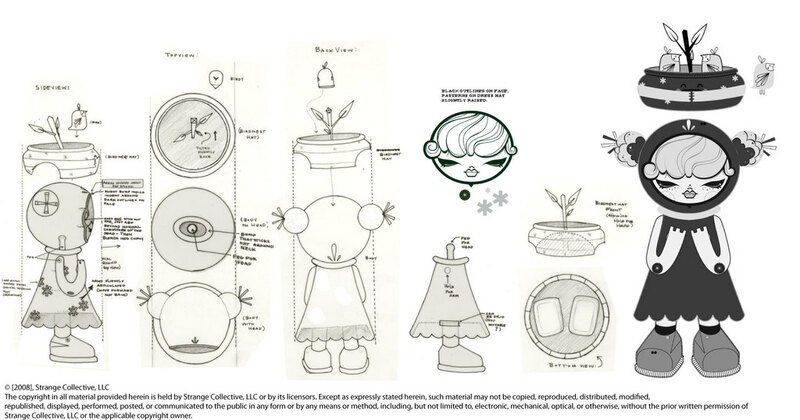 As you'll see below in the reflections on the sculpting process from Julie West and Emily Brough of STRANGEco. the translation of 2D turnarounds into a 3D form can reveal unanticipated problems with the initial design. In particular, Julie describes one fairly large designdecision that was made after viewing the first round of sculpts. "Overall I was really (REALLY) pleased with the sculpts. They were virtually exact to what I pictured - and apparently that is not always the case. There were a few bits that seemed a bit odd to me - mostly with the face. Thier eyes and noses seemed too pronounced and did not really fit with the rest of the toy. Since my work is typically really flat and 2 dimensional, it seemed strange to suddenly see the faces in 3d. After a bit of mulling it over, I decided it might be best to remove the 3d sculpted details on the faces and simply print them on. For the most part, it all seemed pretty straightforward to me at this stage. I was really pleased and thought they did a great job. The things that needed changing seemed to be minor fixes." STRANGECo's Emily Brough worked closely with Julie on the production of Bumble and Tweet. She took time away from her busy production schedule to give us her thoughts on the sculpting process. "After finalizing the character choices for this project, we were very excited to see the translation of Julie's work into 3D. And we couldn't be more pleased. As seen in the turnaround process, Julie thought a lot of the detail out ahead of time which made the sculpt process quick and painless. We only had to fine tune a few details to really nail her overall aesthetic"
As Julie mentioned, the primary change request was to drop the sculpting of the facial details and rely instead on paint application so as to create a more accurate translation of her art. As Emily explains, there were several other minor issues that became apparent once the figure was sculpted. "The only other major change was to the head dresses. At first look, they seemed too small. However, when we compared them side by side to the turnarounds, they were totally accurate to how she had drawn them. But the translation to 3D skewed the perspective somehow. The sculptor increased the sizes so we could get an idea about how it'd look and we ended up liking it much more. Around the time we were working on the sculpt, we finalized the color turnarounds and realized the sculpted dress patterns would limit what Julie wanted to do with some of the deco she had drawn out for the different color ways. Our final tweak to the sculpt was to remove those patterns and we were good to go!" 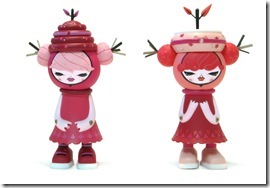 Click through for additional pics of the Bumble and Tweet sculpts. Look for the next update on Bumble and Tweet in a few weeks right here on Vinyl Pulse. 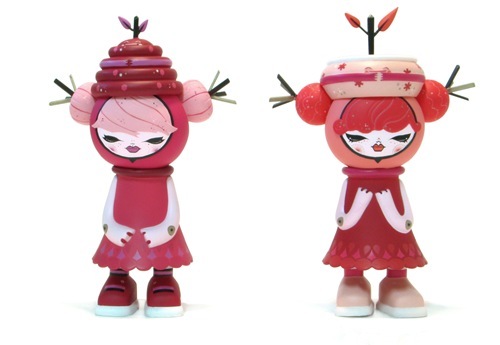 Today we're bringing you an exclusive first look (turn-arounds) at Julie West's first original vinyl figures, Bumble (above) and Tweet (below), currently in production from STRANGEco. Over the next several months we'll be bringing you updates on the development process through all the key stages -- sculpting and revisions, color samples and revisions, packaging, and the finished product. Each update will feature commentary by both Julie and STRANGEco's production team. Julie West has exhibited her art in numerous group shows around the world. Whether on a 2D surface or on a 3D toy, her characters bring a unique aesthetic driven by her signature rendering of facial features. Her customs are remarkably well-executed with crisp, immaculate lines. 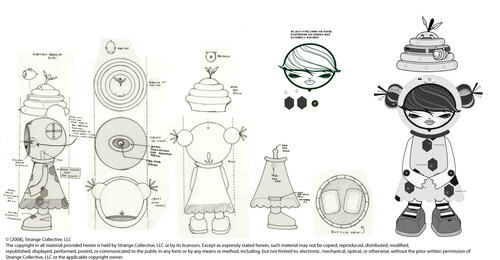 Here's Julie's take on the initial design process for her upcoming vinyl figures, the release of which ( ~ August '08) will likely result in the widest audience for her personal art to-date. Julie: The characters are an extension of ideas and themes that I use in my regular work - a 3d version of what I typically do in 2d. I tend to draw a lot of birds (especially birds) and bees along side human characters and they are really prevalent in my work.